Israeli PM Ariel Sharon and opposition leader Shimon Peres have agreed a compromise deal which paves the way for a new coalition government. Correspondents say Mr Peres' precise role had been the final obstacle to forming a coalition. This was held up by a constitutional ban on having more than one vice-prime minister, a title Mr Peres had sought. 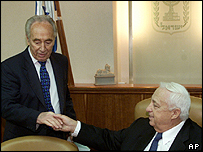 Mr Peres has agreed to become deputy premier - making him the most senior person in government after Mr Sharon. However, the constitution does allow for several "deputy" prime ministers. Current Vice-Prime Minister Ehud Olmert will retain his position and authority. A new national unity coalition could now be formed as early as next week. The deal ends weeks of wrangling over the distribution of roles and titles in the national unity government. Mr Sharon's office released a statement saying: "Peres will be named as number two to the prime minister and will be considered the most important member of the cabinet after the head of government." The Sharon government has operated without a parliamentary majority for six months. The prime minister won approval earlier this month from Likud's central committee to bring centre-left Labour and its 23 MPs into a new coalition. Mr Peres is a Nobel peace prize winner and former prime minister and foreign minister. Mr Sharon has sought a broad-based coalition government to help him push through his plans to pull 8,000 settlers and soldiers out of the Gaza Strip next year. Mr Olmert said on Thursday that the Israeli government will have to carry out a more substantial withdrawal from the occupied West Bank once it has completed its current Gaza evacuation plans. Speaking to the Jerusalem Post, Mr Olmert said Israel's interests required disengagement on a larger scale. Mr Olmert did not say which areas he believed should be evacuated. Correspondents say that, as a close ally of Mr Sharon, Mr Olmert has often been the first in the Israeli government to make future policy public.